MOSCOW (Reuters) – Russian Orthodox Patriarch Kirill asked Russians to pray for rain on Sunday as wildfires raged across the European parts of the vast country, sweltering since June in an unprecedented heatwave. The hottest weather since records began 130 years ago has withered crops and pushed thousands of farmers to the verge of bankruptcy. “Grief has come to our nation, human lives have been lost, hundreds have lost shelter and thousands have been left without sustenance, including many children,” national media quoted Patriarch Kirill as saying in a prayer during a visit to the Nizhny Novgorod region, one of the worst hit by fires. 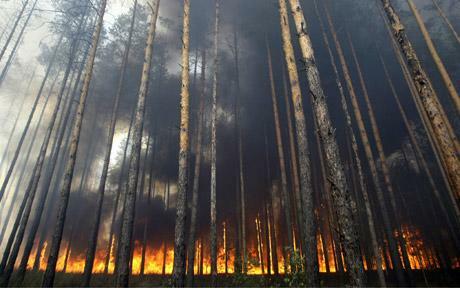 At least 28 people have died in wildfires in European Russia in the last few days, the Emergencies Ministry said, adding that by Sunday morning a total of 774 fires had been registered, including 369 ones that occurred since Saturday. More than 5,200 people have been evacuated from disaster-stricken regions, it said. “The threat of new fires has increased sharply due to unfavourable weather in a number of regions in the Central and Volga federal districts, with temperatures soaring to up to 40 degrees Celsius (104 degrees Fahrenheit) and winds of up to 20 metres per second,” the Emergencies Ministry said. Around 240,000 people were battling the flames, the Emergencies Ministry said. Army units, including elite paratroops, were taking part in the fight. Prime Minister Vladimir Putin has ordered his government to allocate 5 billion roubles (105.2 million pounds) to help fire victims.